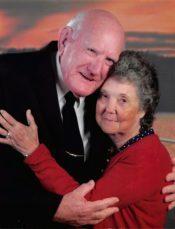 Dorothy Earline Beech, age 88 of Pensacola died March 14, 2019. A service celebrating her life will be at 11AM on Tuesday, March 19 from Pensacola Memorial Gardens and Funeral Home. Visitation will begin one hour prior to the service at 10AM. Interment will follow in Pensacola Memorial Gardens. Mrs. Beech was born in Mobile, Alabama on July 25, 1930 to her parents Milton A. Tee and Caulie Tanner. She made her home in Pensacola for the past 54 years. She was of the Assembly of God faith and she LOVED to fish. She is survived by her husband of 68 years Ellis L. Beech, daughter Carmeen Wicker (Tom) of Pensacola; sons William A. Beech (Janet) of Cantonment; James D. Beech (Glenda) of Pensacola; Ricky Lee Beech (Michele) of Milton and one brother Bucky Tee (Lois) of Mobile. Also surviving her are 9 grandchildren, 13 great-grandchildren and 1 great great-grandchild. The family would like to thank Linda Lewis, Linda Childress, Jackie Ware, Lynn Colado and Angela White for their love and care of Dorothy. We are so sorry to learn of her passing. She was a sweet person and a blessing to so many. What a comfort to know she is with the One Who loves her most. So sorry to hear about Earlines passing. I only knew her for a short period of time, but what a life she lived. We talked about her children and her love of fishing and looking forward to going out and fish again. I pray that our God will cover her family with peace and comfort. So sorry to hear about her passing. She was was a kind hearted and well loved women of god.She will be truly misted. Thinking of you all during this difficult time. You are in our thoughts and prayers. We love you! We are so sorry for your loss! Your mom was always so sweet and made us smile each time we saw her! Our love and prayers are with you all.